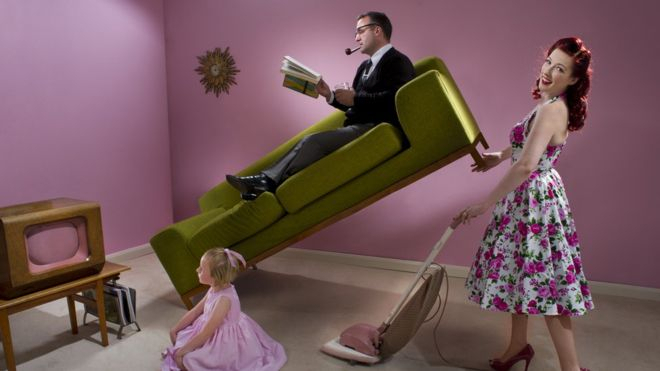 The UK's advertising watchdog has said it will ban "gender stereotypes that are likely to cause harm, or serious or widespread offence". The Committees of Advertising Practice (CAP) said harmful stereotypes in adverts "contribute to how people see themselves and their role in society", and can hold some people back. The ban will cover men struggling with household chores or girls being less academic than boys. The rules come into force in June 2019. The change follows a review of gender stereotyping in adverts by the Advertising Standards Authority (ASA) - the organisation that administers the UK Advertising Codes, written by CAP. As a result some people could be held back from "fulfilling their potential, or from aspiring to certain jobs and industries, bringing costs for individuals and the economy", it added. Ella Smillie, a policy expert at CAP, told the BBC: "There is nothing in our new guidance to suggest that ads can't feature people carrying out gender-typical roles. "The issue would be if in that depiction it suggested that that's the only option available to that gender and never carried out by someone of another gender. "So for example if you had a woman doing the cleaning, we wouldn't anticipate a problem. But if you had an advert with a man creating lots of mess and putting his feet up while a woman cleaned up around him, and it was very clear that she was the only person that did that at home, that's the kind of thing that could be a problem." The CAP also said that adverts that emphasised the contrast between a boy's stereotypical personality, for example, being "daring", with a girl's stereotypical personality, for example, being "caring", needed to be "handled with care". Under the new rules, gender stereotypes would not be banned "outright", the committees said, because the evidence did not show that the use of gender stereotypes was always "problematic". CAP's director Shahriar Coupal, said: "Harmful gender stereotypes have no place in UK advertisements. "Nearly all advertisers know this, but for those that don't, our new rule calls time on stereotypes that hold back people and society." The watchdog already has rules in place which ban adverts that include gender stereotypes on grounds of "objectification, inappropriate sexualisation and depiction of unhealthily thin body images".